​For all the headline concerts on the Wish Farms Soundstage — which take place at 3:30 p.m. and 7:30 p.m. each day — there are about 3,000 free seats available for all shows in the Morrow Steel Free Grandstand. Those seats are filled on a first-come, first-seated basis as part of your paid gate admission. Reserve seat tickets are available for $15 and up (varies by show), while supplies last. Click on Artist's name to jump to that album, or scroll down to view all. Newest Single: "Outta My Head"
We caught Alexandra Demetree as she performed on the Brighthouse Stage at the Florida Strawberry Festival in Plant City, Florida on 3/11/2016 at 1:00 p.m. filling in for Branch and Dean who were in Washington, D.C. to receive an award for their work with Cystic Fibrosis. "Born and raised in Jacksonville, Florida, Alexandra grew up listening to inspirations from Motown to Country and her favorite belty divas. She has performed for First Lady Barbara Bush, and at Walt Disney World, and soloing the National Anthem at the Toyota Gator Bowl. As a homegrown Southern girl and eldest child in a close-knit family, it was a leap of faith when Alexandra spread her wings and attended Northwestern University, where she continued to grow as an artist. There, she completed NU's well-renowned musical theater program, and performed regularly, even touring in Cape Town, South Africa. After graduation, Alexandra moved to Music City; she signed with SSM Nashville Records and reached a milestone when she became a recording artist. Alexandra continued performing and soon released the first tracks from her debut album, "Pick Me Up", "Just Alone", and "Lay It On Me"-- receiving national air play on country radio. She just released her new single "Outta My Head" which is also receiving air play throughout country radio stations all over the nation. Alexandra Demetree's music is the culmination of her hard work and determination. 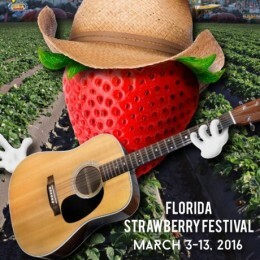 It's a little fun, a little soulful, and a lot.... her"
John Anderson performed on the Wish Farms Stage at the Florida Strawberry Festival on March 11, 2016. He was a last minute fill in for Ms. Tanya Tucker who had to cancel due to health issues. She was in the hospital but doing better so all our thoughts and prayers to out to her at this time. John Anderson Bio (from Web-Site). "​To put it simply, John Anderson is one of the greatest country music singers to ever step up to the microphone, possessing one of the most instantly recognizable vocal instruments in the history of the genre. On his latest album Goldmine, released on his own Bayou Boys label, Anderson has completed a long overdue record of original songs. The award-winning songwriter wrote or co-wrote 12 of the album's 13 tracks. That will bring joy to the hearts of some of the most devoted fans in country music. Goldmine is also a record that, given the current state if contemporary country, could, like Cash and Haggard before him, find a home amid lovers of authentic music of any genre. Though he would never compare himself to his heroes, the fact is, John Anderson is now the standard bearer for traditional country music, of the 100 Proof variety. Raised in Apopka, Fla., Anderson was exposed to both rock and traditional country growing up and, as incendiary rock outfits like Tom Petty and the Heartbreakers and Lynyrd Skynyrd honed their chops around him, learned to love (and play) both types of music. But Anderson resisted the call of rock 'n roll, electing rather to pursue his country music dreams. It was the traditional country ballads that lured him in and changes music history, songs like Porter Waggoner's "Green, Green Grass of Home." "I loved those type of ballads," Anderson says, "to the point I didn't want to get away from it. Anderson moved to Nashville in 1972, working contruction by day (including as a roofer at the Grand Ole Opry House) and playing the honky-tonks at night. He signed to Warner Bros. in 1977, and notching his first major hit in 1980 with Billy Jo Shaver's "I'm Just an Old Chunk of Coal (But I'm Gonna Be a Diamond Someday)." Other hits, including the classic "Wild and Blue" in 1982, solidified his status as a powerful new voice in country music. "Swingin'," written by Anderson and Lionel Delmore, blew the roof off a year later, exploding to No.1 on the Billboard Country chart, propelling Anderson to the CMA Horizon Award, and becoming one of the most enduring hits in the country canon."